Barcelona's Liceu opera house welcomed a very special guest on Sunday in the shape of the virtuoso composer and musician from Iraq, Naseer Shamma. Considered a master of the Arabic lute known as the oud, Shamma performed in the Liceu along with 30 musicians from Bait Al Oud, an institution in Abu Dhabi devoted to the traditional instrument. 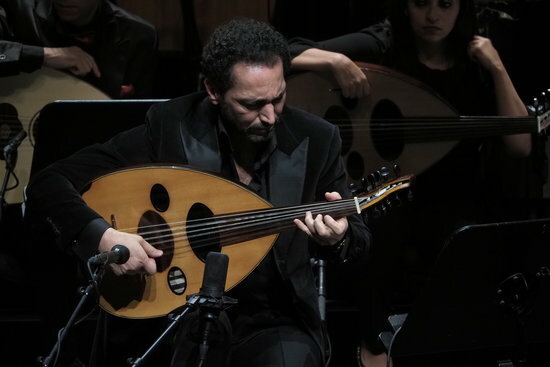 Shamma and his ensemble performed Ashur to Seville, described by the Liceu as a piece that "seeks to reinforce the musical links between the Arab world and Europe while reflecting Shamma's characteristic style." During the concert, Shamma's nimble fingers paid tribute to past artists from places such as Andalusia and Iraqi Kurdistan, and reproduced a range of musical styles from different ages and cultures. In showing the audience the range of sounds and melodies the oud is capable of, Shamma was also accompanied by Carlos Piana and Giorgos Manolakis, who took part as guest musicians. The concert was part of the 15th edition of the Abu Dhabi Festival, the largest artistic and cultural event held every year in the United Arab Emirates. Shamma's appearance was the result of an agreement between the opera house and the Abu Dhabi Music & Arts Foundation (ADMAAF), with the aim of promoting cultural exchange with the Middle Eastern country. Signed in 2015, the agreement is the first cultural exchange that the Liceu has made with non-profit organization, which is one of the oldest and most renowned in the Persian Gulf.